Kendo.data.ObservableArray can be defined as below equation. 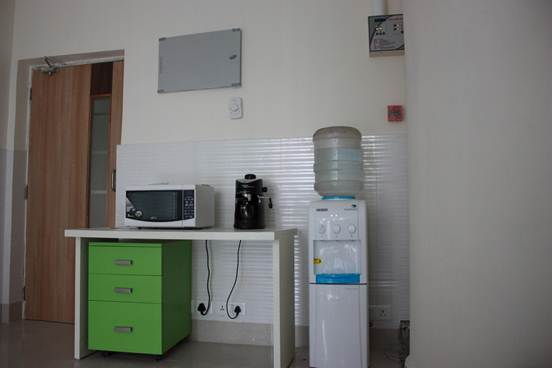 It is a simple array with capability to track the changes. Array can be traversed in usual way as following. 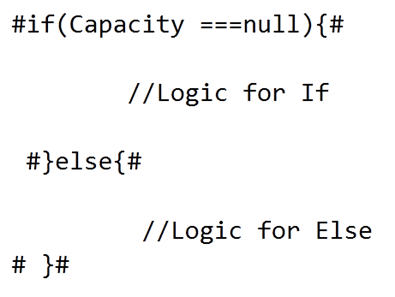 length filed returns number of elements in the array . On any change in the observableArray change events gets fired. 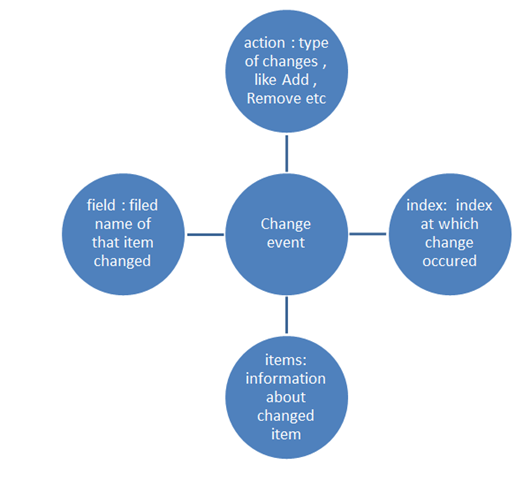 You can bind change event to array as following. Join method takes a string input parameter. So far we have worked with primitive type string observablearray. We can have complex type observablearray as well. We can create and traverse that as following. In this way you can work with Kendo Data ObservableArray. I hope you find this post useful. Thanks for reading. While creating application, a very common requirement you may come across is to dynamically navigate from one View to other on basis of some query parameter. 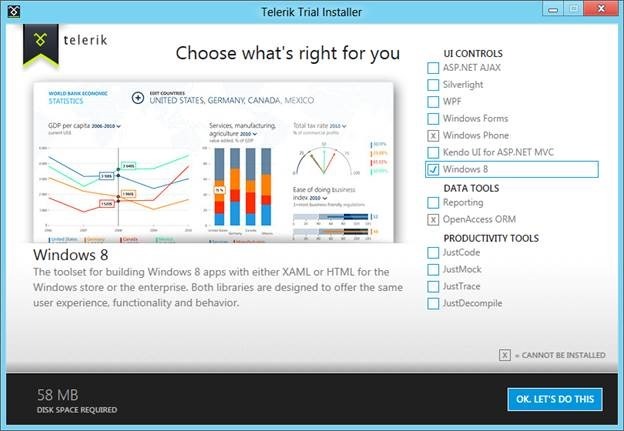 Consider a requirement from below diagram, when you click on a particular session, you need to navigate to session detail view. On Session Detail view fetch the data on basis of the Session Id passed from All Session View. 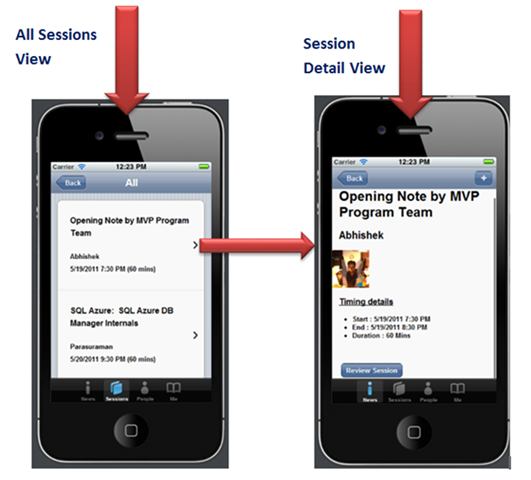 Dynamically display Session Detail of a particular Session on Session Detail View. 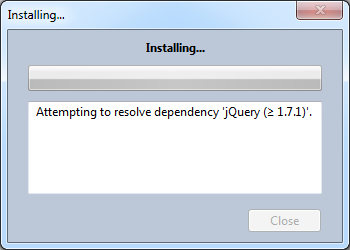 At very first we need to set the query parameter in Template of All Session View as following. 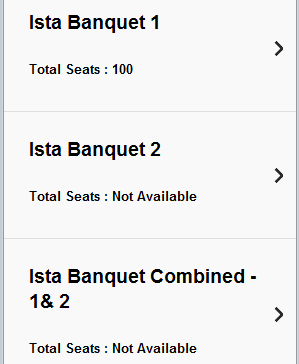 If you notice we are setting Session ID as query parameter in list view link button. On click of the detail button, application will be navigated to SessionDetails view with Session ID as value in query parameter. Once you have value of Session ID passed from All Session View on Session Detail view, filter the data source on this Session ID. 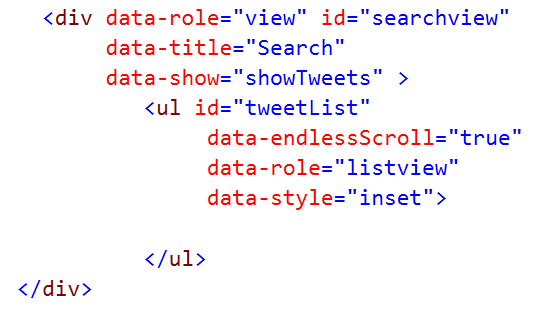 After fetching filtered data, data can be bind to Session Detail template as following. 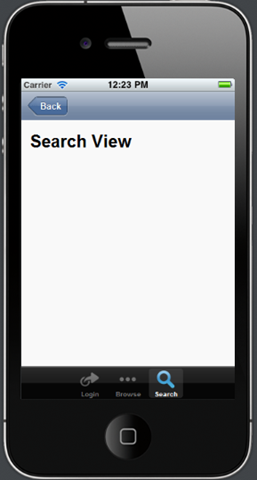 This is what all you need to do to do navigate from one view to other with data. I hope this post is useful. Thanks for reading. 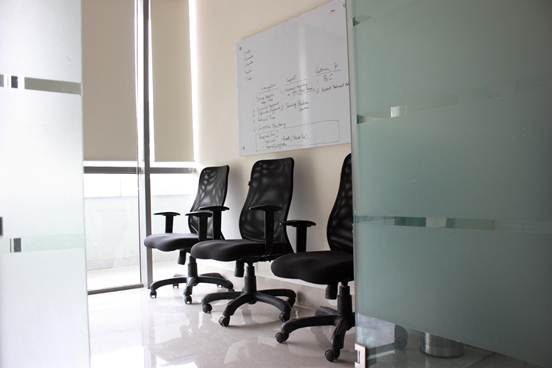 It takes 4 steps to working with Kendo UI. So lets see the 4 steps in detail in the coming sections. The simplest of all the steps :). This step involves downloading of Kendo UI. You can download Kendo UI from the download page at: http://www.kendoui.com/download.aspx. Kendo UI comes with a free 30 day trial and I highly recommend downloading that. Rest of the sections will assume that you have downloaded kendo ui on to your hard disk. Once you have downloaded the Kendo UI on to your hard drive next step is to start using it in a HTML page. First piece to get in place is the stylesheets required by the Kendo itself. 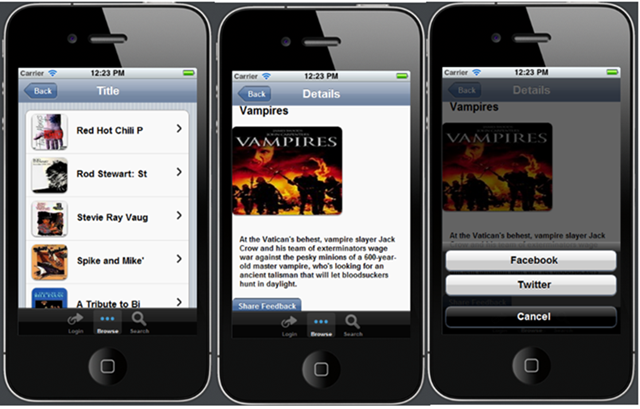 These stylesheets are responsible for giving the look and feel of the UI controls or widgets as we call them. 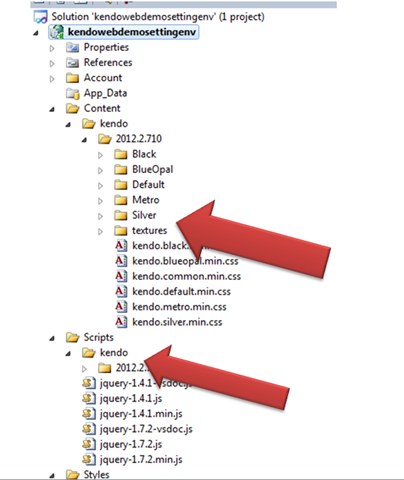 When you install the Kendo ui the styles folder contains all the required stylesheets. 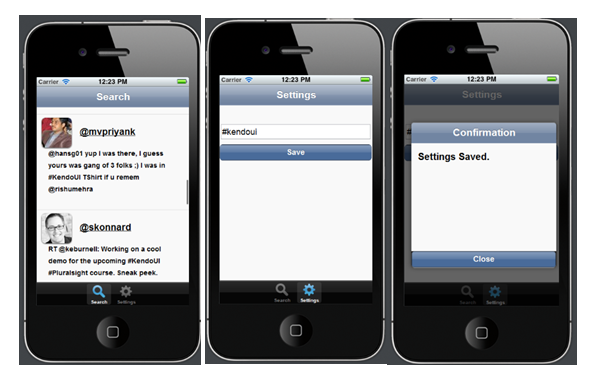 Kendo UI ships with 5 themes namely – Default, Black, Blue Opal. Metro and Silver. 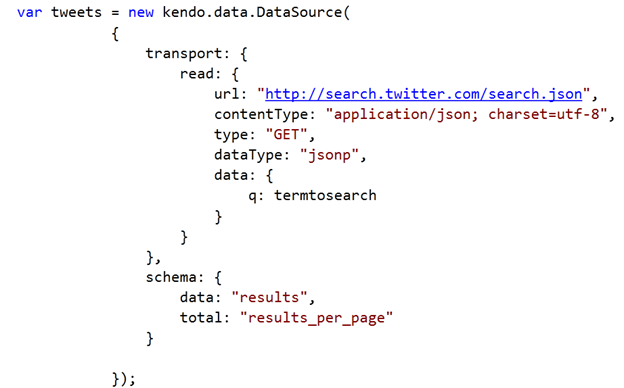 If you are working with Data Visualization, then instead of the kendo.web.min.js you will need to refer kendo.dataviz.min.js file. This is the interesting step. 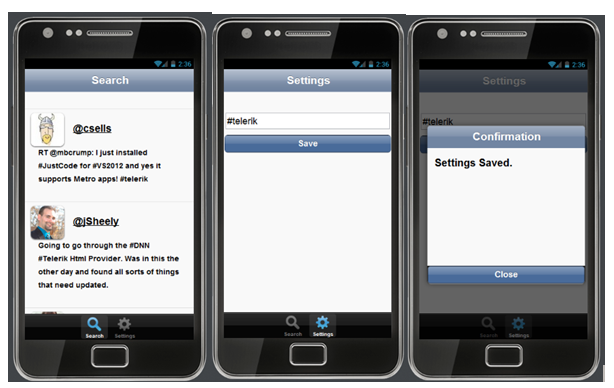 With Step 2 and Step 3 we have set the stage for the most interesting part of the journey with Kendo UI. Stykesheets and scripts necessary to work with Kendo UI has been referenced. 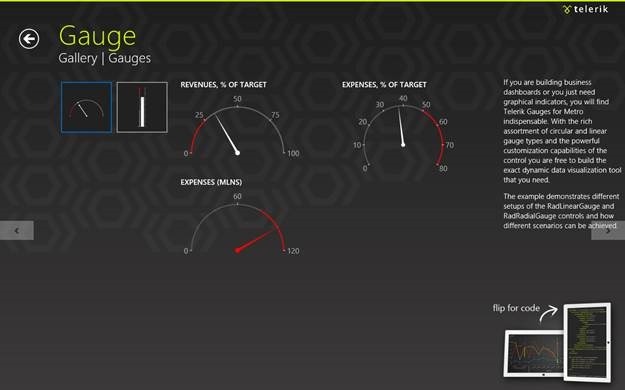 Now we see how to initialize the kendo UI controls or widgets. 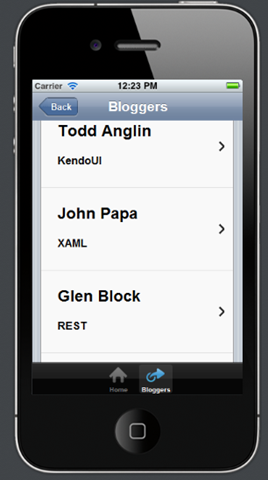 Kendo UI Web as nearly 19 widgets to work with. 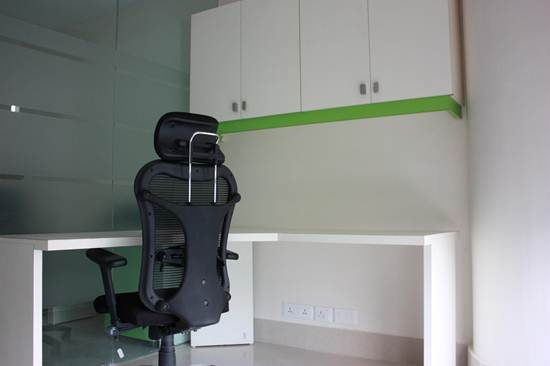 You can know more about this at http://demos.kendoui.com/web/overview/index.html. In this post we saw how easy it is to work with Kendo UI. with simple 4 steps you are ready to take a ride with Kendo UI. Although we saw a simple example of calendar being initialized, pretty much all the widgets in Kendo UI can be initialized in the same mechanism. Hope you will do the step 1 and following along till step 4. 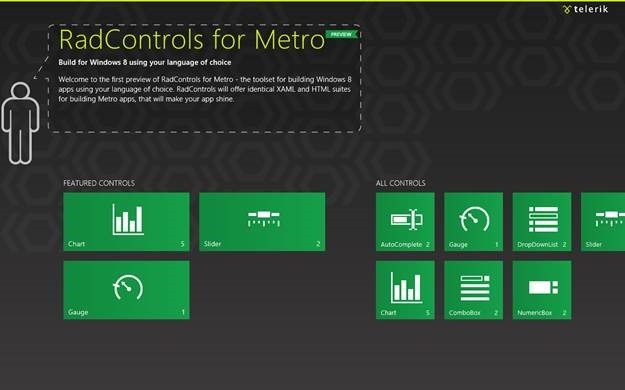 You can download RadControls for Metro from here . 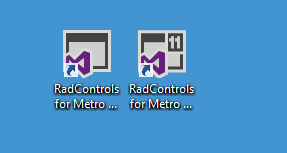 RadControls are available in both HTML and XAML flavor. 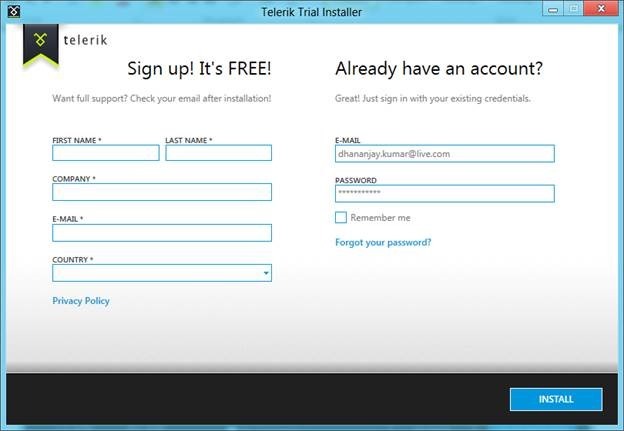 If you already have an account login using that else register yourself and click on Install. 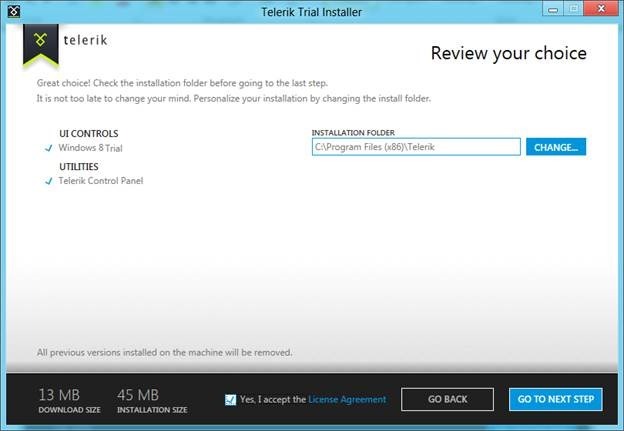 Once successfully installation done, you should be getting the following window. 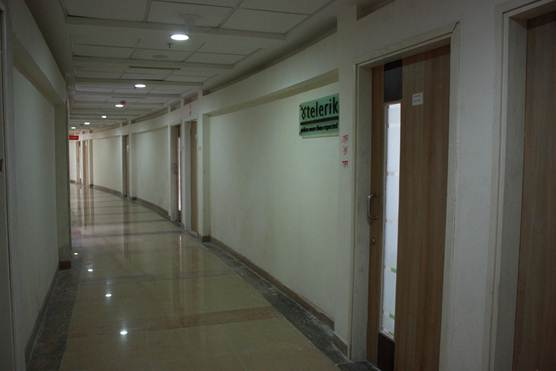 After installation you should get two demo solution created. One for HTML and one for XAML project template. Go ahead and open visual studio solution of your choice of language. And run it either on local machine or Simulator. You should able to see the code. 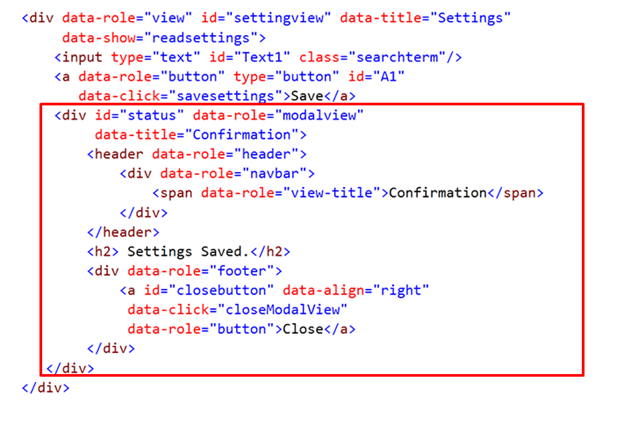 From drop down choose CSS, HTML or JS file. So here you got all the demo and source code associated with that to get it started. Now start playing with controls and since it is still in Beta version you may have some feedback to product team. I later post we will explore each controls one by one. 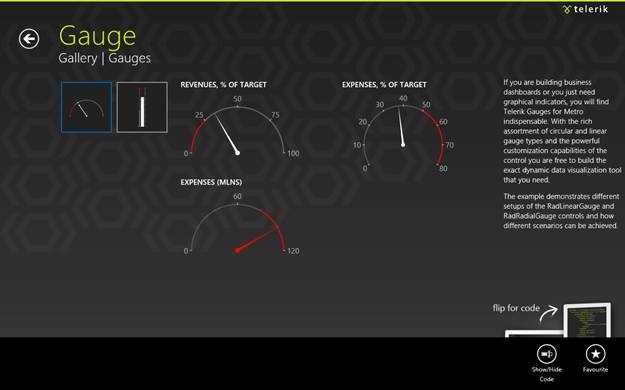 In this Webinar we will help you to get it started with Kendo UI. We will cover many demos to have a better understanding on the Kendo UI as product. Find below the details to attend the Webinar. Below is Live Meeting URL to attend the Webinar. We would like to encourage you , your team to attend the Webinar. On walking through code I found, I have added css reference twice. I went ahead and removed duplicate reference. After that I found Back button was rendering as expected. I hope this small observation will help you in creating your cool applications using Kendo UI Mobile. 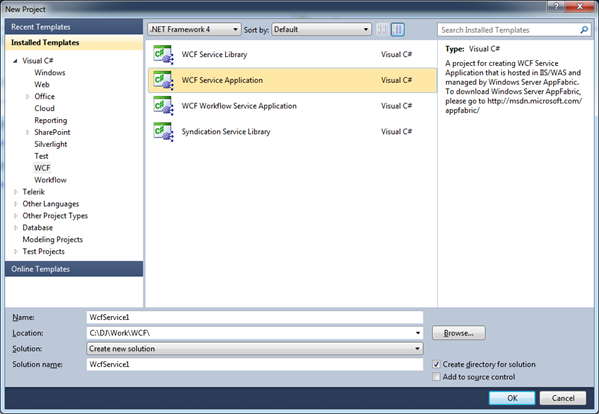 In this post we will walkthrough on setting up development environment in Visual Studio 2010 by installing NuGet package of KendoUI. 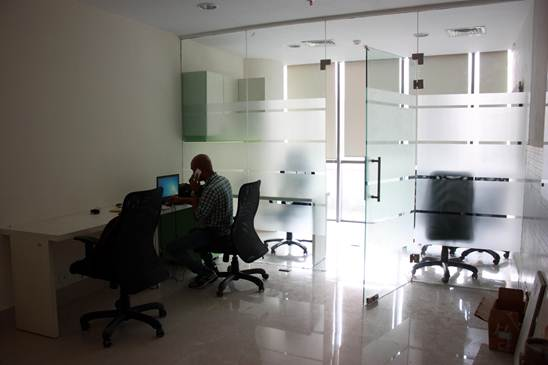 To start with launch Visual Studio and create Web Application project. 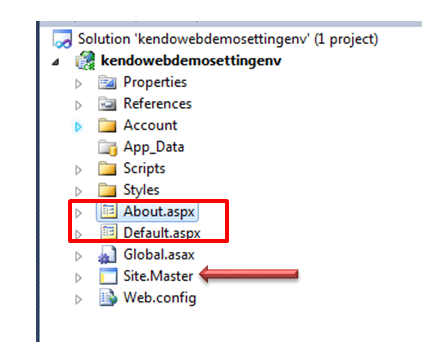 Now delete Default.aspx, About.aspx,Site.master files from the project. 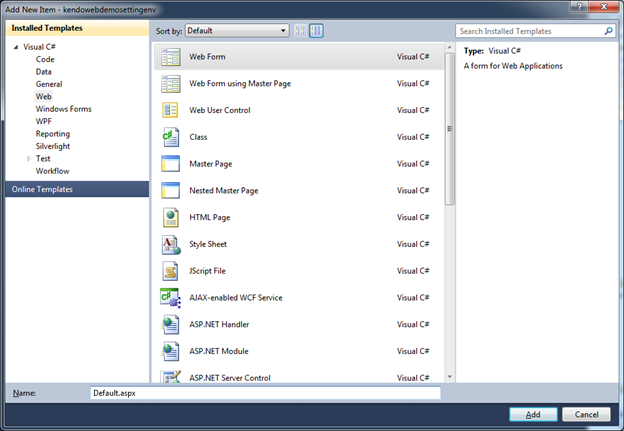 After deleting files right click on solution explorer and click on Manage NuGet Package. 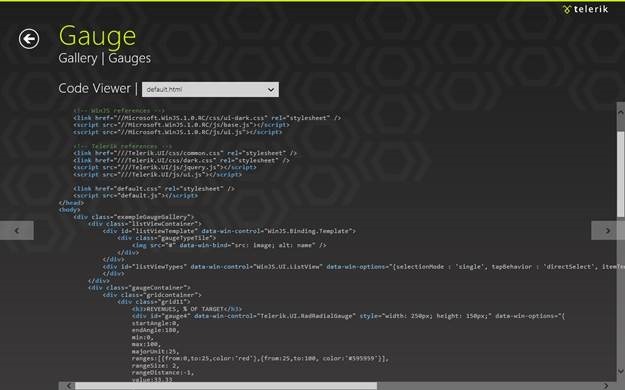 In Mange NuGet Packages windows search for KendoUIWeb. 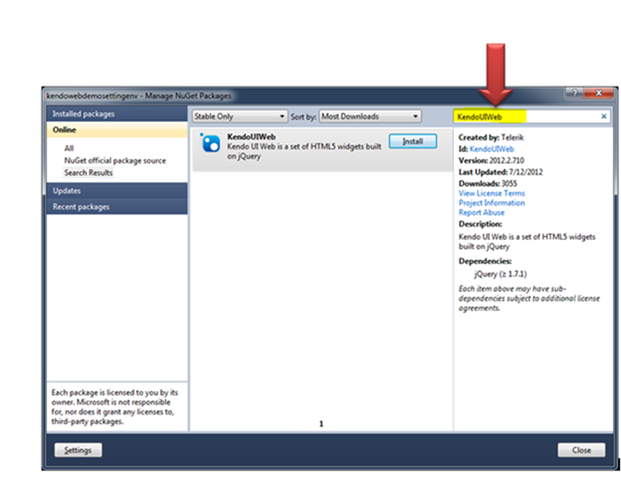 After searching once you get the package click on Install button to install all Kendo UI Web components to the project. 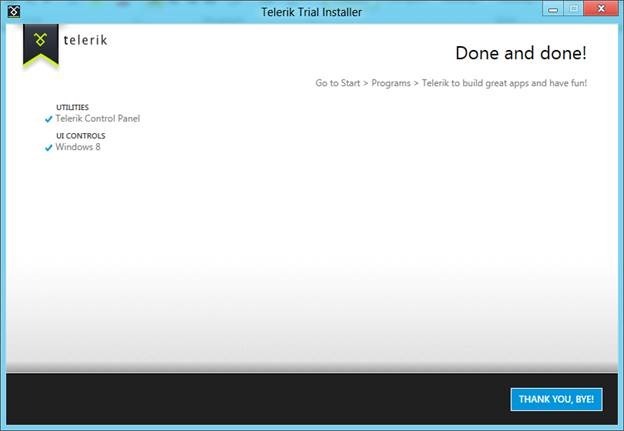 After clicking on Install, you should get Installing window as following. 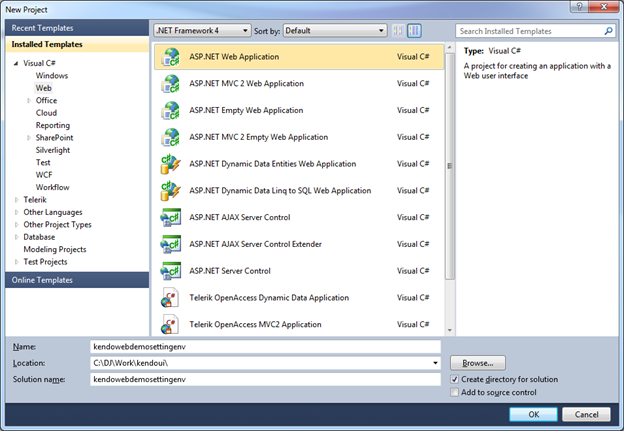 After successful installation close Mange NuGet Packages windows. Once KendoUIWeb has been installed you will find KendoUI JS files has been added in Scripts folder and KendoUI CSS files along with images has been added to a kendo subfolder inside Content folder. Once all the required files have been added to the project, next add a Web Form. To add a web Form right clicks on solution explorer and click on Add New Item. 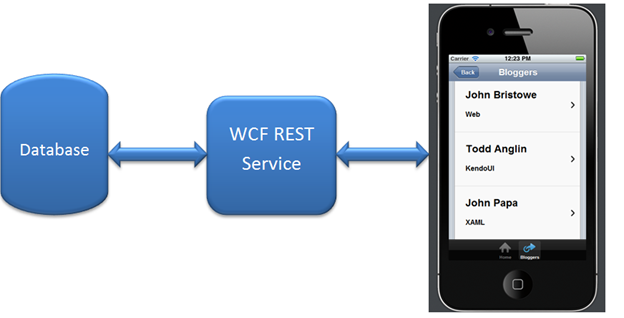 Choose Web Form from Web tab . Now we need to add reference of Kendo on the Web Form. 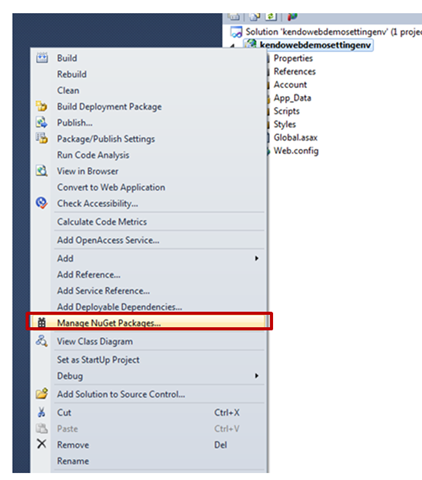 To get started with development add minimal you need to add below references on the page. In this post we will look into, the way to format DateTime type columns of OData feed as string in Kendo UI Template. 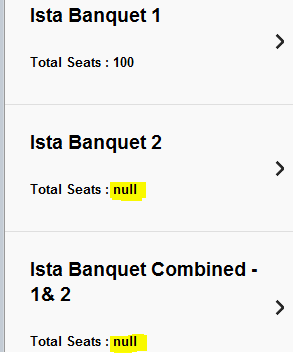 You will get date formatted as following. Passing created date to kendo.string to format as desired. 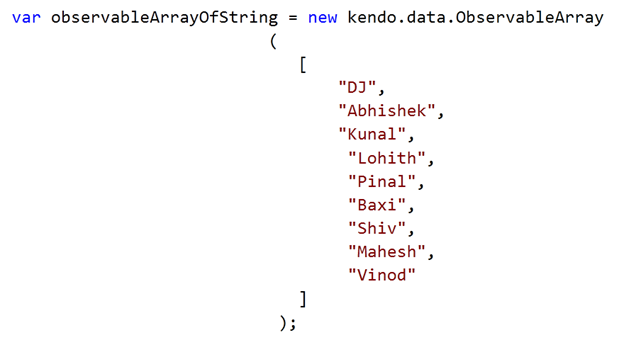 In this way you can format a ODATA DateTime column using kendo.string. I hope you find this post useful.